Do you want to share big files via WhatsApp? Want to share a picture without resizing and without losing quality? A document, an application, a song or any other file type up to 1000 MB or 1 GB? Yes, now you can. As we know Whatsapp is most popular instant messaging application today. Its competitors are approaching, but none has achieved the number of users currently available in the Whatsapp database. One of the weaknesses of Whatsapp is the few options available to send files. .You can easily send pictures, videos and audio files, but you cannot send any other file types, such as documents or mp3 and some other large files. Now you can, with whatstools app. With the help of Whatstools you can share via WhatsApp, any file up to 1 GB, no matter what its extension is: .doc, .pdf, .apk, .mp3, .mp4, .jpg, .png, .tiff, music, documents, photos, etc. Whatstools give Whatsapp app a boost with it’s Advanced File sharing and direct integration technique. You can preview your files before sending which makes it much easy to share. It also make it easy to preview before download with One Touch Download feature. It also has pause/resume feature which is good. With this you can resume your download in case connection is lost due to any reason. Manage all files (sen/recieved) at one place. you can also share those files via SMS, or use any other app like Facebook. 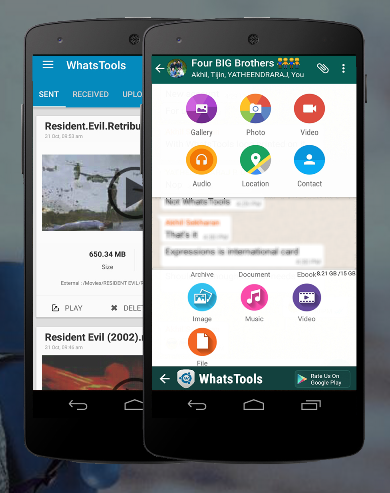 As the name itself suggests, whatstools comprises of certain tools that assists whatsapp. After downloading & installing whatstools from Google Play store, it has to be given accessibility from phone settings & it will be directly connected to Google Drive. To be on safer side, files are blended with Google Drive for more & more safety. After all this process, get accessed to whatsapp again and open the attachment icon. Their, you can geton with additional six icons that helps various other type files to be attached like achieves, .PDF, .apk, etc. Those icons are buildup by Whatstools. Any audio/video files can be attached through this, without loosing its quality. You can also enter whatstools directly and can send files to any contacts. Most interesting part lies within is, uploading files can be paused, deleted or recontinued. Moreover, the downloader can have a preview option before downloading that particular file. Knocking on with above features, it is certain that, Whatstools can play a lead role for Whatsapp in time to come. Important Note: Both sender and receiver must have Whatstools installed to send and receive files. Since it is a small free application and supports android 4.1 and up, this should not be a problem for anyone. You can find it in the Google Play (it’s free). Its nice but its a app dependent trick…but I am trying to find a direct method like mobile root method ..